Bryan Quinsey, the Executive Director of the American Farrier's Association, argues that farriers do not only shoe horses, they provide foot and hoof care for nearly 7-million horses in the United States. Dr. Judith Mulholland, an Australian veterinarian and farrier, traces the Evolution of Farriery. She demonstrates with excellent images and narration what good farrier practice is all about: "leaving the horse sounder than you found it." She explains why we shoe horses, elaborates on trimming theories, concluding with "The golden rule of veterinary medicine, farriery and trimming your own horse's feet is “first do no harm”, if your horse has bad feet, trim it “little and often”. I am confident that poor hooves can be dramatically improved by one years worth of good, regular farriery care; but, if that good farriery stops the hooves will revert to what ever problems they had previously if the hoof is predisposed to it by poor limb and foot conformation or environmental factors such as wet ground and poor diet. Naked and natural work best when a hoof is normal conformation or is slightly contracted. 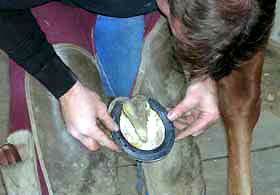 When a hoof is abnormal e.g., flat soled that must be dealt with first. A horse limping around with thin, prolapsed soles due to poor conformation, flat feet or neglected chronic laminitis and sole pressure is miserable and requires "professional" quality farriery to relieve the discomfort. In the short term shoes e.g., glue-on, nail-on, slip-on etc., or reconstruction techniques may be essential to give that animal comfort. Providing non painful answers to our farriery problems is our obligation as horse-owners, farriers and veterinarians. So the answer to this issue is yes, there is a lot of good in the core of trimming theories and natural horse ideals. But, beware of those who have got hold of some of the information and some of the principles and then try to baffle you with “bull-dust” and leave you with a horse that has been over-trimmed and is foot sore. Farriery is all about leaving the horse sounder than you found it."